The Accidental Citizen-Soldier: An English teacher's worst nightmare? In 2002, Young Chun - born and raised in the U.S. by parents who had emigrated from Korea - came to Korea to teach English and pay off university debts. When he applied for an F-4 visa at the immigration office, he was informed by a confused immigration officer that he couldn't get one because he was, in fact, a Korean citizen; someone had put his name on the family register when he was born. Through a string of bad luck, he eventually found himself with an immigration exit ban and orders to report for military service - even though he didn't speak Korean. Given no assistance by the country of his birth, and unable to evade this order without going to prison, he reported for basic training in January, 2004, and began a two-year experience which would even involve deployment to Afghanistan. This story is told in Young Chun's recently-released memoir "The Accidental Citizen-Soldier: The Story of an American in the Korean Army." He was kind enough to send me a pdf to review, and within a few pages I was hooked. In addition to having fascinating subject matter, it's well-written, well-paced, and sprinkled with enough humour to lighten an otherwise somber story. 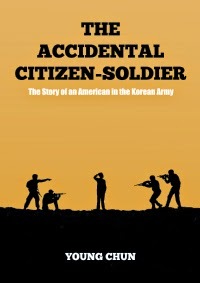 Military service is an experience almost all Korean men have to suffer through, and "The Accidental Citizen-Soldier" provides a first-hand look at what it entails, detailing all of the humiliations, power struggles and occasional kindnesses. It's gratifying to see him proceed through what is often an inhumane system and come to understand it and use it to his benefit, even finding time to translate a Korean novel for a translation contest. More about Young's story can be found in this interview he gave to a Seattle newspaper in 2004 (which didn't go over well when his superiors found out), as well as at his blog, where you can listen to a recent interview given for TBS radio. The book is well worth reading and can be found at Amazon.com for what should be $2.99 for a Kindle edition (a way to get around a tacked-on $2.00 'international charge' is detailed on his blog). A softcover version is also available and there are currently a handful of copies at the Gwanghwamun branch of Kyobo Bookstore. I think the biggest difference is each army's attitude towards its soldiers. The US Army treats its soldiers as human beings with civil rights to be respected and needs to be fulfilled. At the time, I felt like the Korean Army saw its conscripts as nothing more than tools, no different than a shovel or a toilet. Prior to my induction, I had heard that the pay was atrocious; I hadn't heard that I would be worked almost constantly with very little sleep, sometimes having to skip meals because the officers wouldn't let me take a break from work (even though they made sure to go themselves). There was never a guarantee of free time, and there were no counseling services even though I was depressed and frustrated for most of my first year. When I was in Afghanistan, I was amazed at all the welfare facilities available on base. They had almost everything I could think of and a lot I couldn't have even imagined. On the other hand, on my base in Daegu, the only real welfare facility for conscripts was the PX, which was dwarfed by the one in Afghanistan. The BX on Bagram Air Base was a Wal-mart. The PX on my base in Daegu was a 7-11. At least, that's how it felt. My company in Daegu had a small trailer with some gym equipment and a single basketball hoop. I've heard that other units had a noraebang and a computer for conscripts to use; my company had neither. I couldn't even check my e-mail on base. In Bagram, I was also amazed by how civilly American soldiers treated each other. In Daegu, it was only ridicule and bullying between soldiers. Aside from your donggi (soldiers who started the same month as you), everyone was someone to be feared or someone to order around. It is the ROK Army culture that forces people to act in such an unnatural way. While on deployment, there was no such protocol in the 2nd Construction Company, and it was much more bearable. I have heard that the ROK Army has been working on treating conscripts marginally better. I've heard that privates now make something like 130,000 won a month and the general atmosphere among conscripts is better, but I don't know for certain. It's kind of a general understanding that it gets a little better and more comfortable every year, and people who did their service earlier are keen to point out that things were more difficult for them. To be honest, I don't think the Korean Army's presence in Afghanistan made a difference one way or the other. Sure, we were a nuisance, but most of the truly outrageous things were suffered by those in command--the base command and the command of the 109th Engineers--rather than the average soldier. That being said, I don't think anyone thought we really contributed to the war efforts, and I don't think much was expected of us. The Dasan Engineering Unit poured concrete around the base and the Dongeui Medical Unit treated local nationals, and for the most part, the Korean soldiers kept to the Korean compounds when they weren't busy shopping. I also asked him about the effect his experience had upon his attitude toward Korea in general. I get asked this question often because people are surprised that I decided to stay in Korea and they usually expect me to be very bitter. Of course, I don't look back at the experience fondly, but the Korean Army is the Korean Army and Korean society is Korean society. There are things that I greatly enjoy about Korea and things that frustrate me to no end, but I don't let my experience in the service color my judgment of Korea. With regard to the people, wherever you go in the world, there are good, kindly, decent people, and there are cruel, selfish, arrogant assholes. The US is no different, Korea is no different, the Korean Army is no different. Granted, the culture in the Army brought out the worst in people, which is one of the reasons why I prefer not to see people I met in the Army. I try to surround myself with the former. I do deeply sympathize when I hear my friends talking about their experiences in corporate Korea because it often reminds me of my time in the Army, and I've determined never to put myself in such a hellish and poisonous environment again. For the first three or four weeks, I simply parroted whatever I was taught without knowing what the words meant. Once I got my Korean-English pocket dictionary, I was constantly looking up words that I heard throughout the day and tried to piece things together. When I was a private, I once got verbally abused for looking at my dictionary while I was walking. I had only wanted to look up a word before I forgot it. "Privates don't get to read and walk," the sergeant said, after he had given me a good shoulder to the back. Once I was in Daegu, I had access to a small library in the squad room. I would choose a novel and go through it, looking up every word I didn't know until I could piece together what was being said. It was very slow-going; I remember spending a couple of days on a single paragraph. The book that I translated for The Korea Times Literature Awards was maybe the first Korean novel I was able to read from cover to cover. I also bought a book on Korean grammar when I was on furlough prior to pre-deployment training. I think I copied most of the entries in my journal. Needless to say, I wrote pages upon pages of vocabulary words and grammar points. That was one aspect of my learning Korean. The other was the hostile environment. If I said something grammatically incorrect or even mispronounced any little word, I was ridiculed and shamed mercilessly. Some people would respond by working harder until their ability was recognized; I basically just shut my mouth and kept to myself. I never yelled at anyone when I was a sergeant, partially because I knew better than anyone how it felt but mostly because I couldn't yell in Korean. I still can't. It's a little embarrassing, but I couldn't speak Korean decently until after I got discharged. Everything I had studied didn't get processed until I finally had the time to process it. Needless to say, I don't recommend going to the Korean Army if you're interested in learning Korean. Thanks to Young for answering my questions. Line 9's extension from Sinnonhyeon Station to Sports Complex Station on line 2 officially opens today (they seemed to be doing trial runs to the latter station in recent weeks; last week I got on at Gimpo Airport and the announcement and on-train information screens both said it was heading to Sports Complex). In late January they changed the schedule to prepare for this opening, going from one express train for every two all-stop trains to a one to one ratio. While this meant more express trains, it also resulted, as Kojects tells us, in there being 60 less train tripss per day, and intense overcrowding at rush hour, as this JTBC report on the 'hell train' - translated at Korea Bang - tells us. This all looks rather familiar. While I was lucky enough to be able to take the express train towards the tail end of morning rush hour (catching it between 8:10 and 8:25), I used Line 9 to commute to work for five years, and it was still quite crowded at that time of day. The report notes that the most crowded stretch is between Yeomchang and Dangsan, and that doesn't surprise me; my commute ended at Yeomchang, and I was always amazed at how crowded it got, sometimes having to fight my way off the train (much more aggressively after once being pushed back onto the train and having my foot drop into the gap). 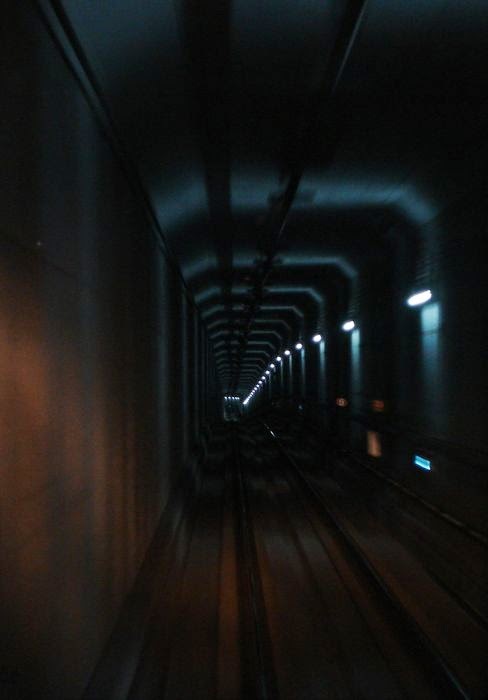 Another memory that stands out is seeing people cram on at Gayang Station (the express stop between Yeomchang and Gimpo Airport) and seeing a man leaning at a 45 degree angle as he pushed the people ahead of him onto the train. The only way to ensure I could get off was to stand next to the door when I got on, otherwise it would likely have been impossible. One problem leading to overcrowding is that there are only four cars in each train, while every subway platform has room for at least eight cars. At this point, the solution won't be more trains running, but more cars on each train. Unfortunately, as Kojects notes, 20 new cars won't be added until late next year, with more to follow the following year. Since the new schedule with more express trains was implemented in January, the number of people using line 9 has increased by an average of 2,700 daily, and the projected number of people using it after the extension opens will be 610,000 daily (compared to 250,000 in 2011, when more trains were added). For now, one rush-hour measure by Metro 9 has been to operate express buses, but I hardly see how useful they'll be in rush hour traffic. 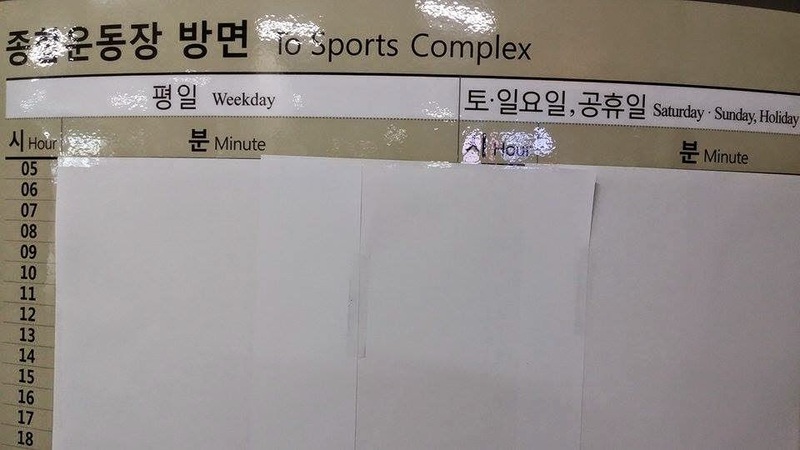 Covered up schedule for trains to Sports Complex at Sinnonhyeon Station yesterday (hat-tip to Ami). Private elementary school native-speaking teacher's corporal punishment of students: "Eat dish soap." Controversy has arisen after it became known that a native-speaking teacher at a private elementary school in Seoul made students taste dishwashing detergent as a punishment during class. According to authorities such as the Seoul Metropolitan Office of Education yesterday, on March 12 at a private elementary school in northern Seoul, 'A,' an English teacher from South Africa used corporal punishment on grade six students who broke the rule against using Korean in class. 'A' told the students to choose between tasting dishwashing detergent and bitter medicine as punishment, and some students chose the former, and some the latter. Once parents found out about this, the school was inundated with complaints and the next day the school dismissed 'A'. On the 18th the school's homepage announced that the native speaking teacher had been changed and carried an apology by the principal. 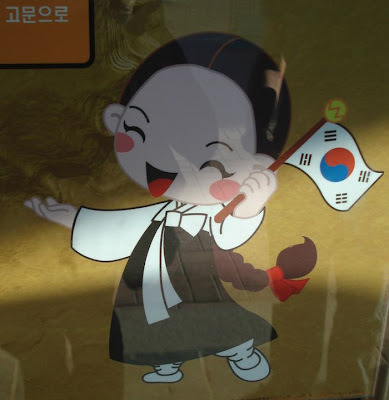 An official from the Seoul Metropolitan Office of Education said, "Because a private elementary school takes it upon itself to hire a native speaking teacher, the responsibility for the teacher's management is also the school's." "If a problem arises, at the level of Office of Education Support, schools are being guided in order to strengthen the management of native speaking teachers and prevent a recurrence." Since problem English teachers are almost invariably depicted to be male teachers, one assumes the teacher was indeed female. We're also shown a shot of her apology letter. It would be interesting to read the entire thing; one wonders what was going through the teacher's head. It was certainly a bad decision (taste dish soap or fingernail-biting-prevention medicine?). I imagine "washing kids mouths out with soap" (which I assume was the intended effect?) would meet a similar reaction in North America. Perhaps - this being near the beginning of a new school year - the teacher was new to Korea. Anyone who has taught grade 6 students can understand how unruly they can be, though usually really bad behaviour would start later in the semester once the students have gotten to know each other. 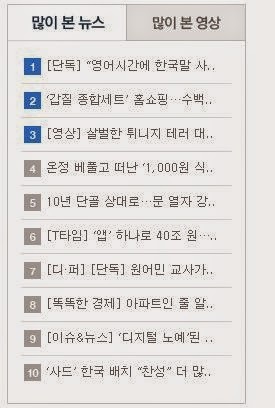 As of last night, the two reports at KBS were the first and seventh-most viewed articles at KBS News' website. As of noon today, the TV news report is the third-most-viewed news article and the most-viewed video at KBS, so the story is currently popular. KBS also followed up with a news article last night and a new TV news report this morning, so it's certainly running with the story - as are about two dozen other news outlets so far. Update: The Chosun Ilbo posted an English language article about this titled "English Teacher Forced Students to Drink Detergent." The Joongang Daily reported the other day that... well, here's the title: "Graffiti punks from abroad target Seoul’s subway." On Feb. 2, four Australians in baseball caps and hoodies appeared around Wangsimni Station, eastern Seoul, at three in the morning. They carefully scoped out the area and then stopped in front of a ventilation window behind a bus stop. They cut the bars of the window and swung down to a temporary garage where a car for the Line No. 5 subway was idle. Using spraypaint, they covered the car with graffiti art and then moved on. It was only after they flew back to their home country on Feb. 7 that the police identified the four Australians with security camera footage. They matched their faces on security footage from the airport and then checked immigration records. We're then told that police are baffled by foreigners who "knew so expertly the subway stations' structures" and that "We believe most of them were painted by foreigners." In fact, they "discovered that most of them are from Australia or Canada based on the style of graffiti paintings." That's some impressive sleuthing. The Joongang Ilbo then goes on to interview a Korean graffiti artist, which begs the question why the police are saying it must have been done by foreigners. No foreigner has been caught by police for defacing the trains, possibly because they have left the country quickly like the Australian group. Property damage is not a serious enough crime to try to extradite them. The Joongang Ilbo has been on a bit of a crusade here, translating another article today, as well as publishing a CBS radio interview with a Korean graffiti artist. I'm not sure that publishing the exact locations of the incidents was the best idea if they wanted to stop it from happening, but then I'm not an editor there. Wet Casements also has a post about this here. Last summer, Colin Marshall, host of the podcast and website Notebook on Cities and Culture, made a lengthy visit to Korea, wrote several articles about Korea's cities for The Guardian (starting here, or scroll down halfway here), and interviewed all kinds of interesting people. He also interviewed me, and our conversation about topics including Isabella Bird Bishop and James Wade's views of Korea, the changing urban landscape, perceptions of foreigners (and foreign teachers), the collapse of the Sampoong Department Store, and old Korean movies can be found here. Many thanks to Colin for including me in his Korea Tour. On a related note, I was also interviewed for Groove Magazine's 100th issue, and that's now online here. Screening this Saturday of Jeong Jae-eun's 2001 film "Take Care of My Cat"
This Saturday, March 7, at 2pm, the Royal Asiatic Society Cinema Club and Seoul Film Society will have a free screening of the 2001 Jeong Jae-eun film "Take Care of My Cat" (고양이를 부탁해) with English subtitles at Seoul Global Center's Haechi Hall, on the 5th Floor of M Plaza in Myeong-dong. When readers of Koreanfilm.org were asked years ago which film they thought best captured the ‘feel’ of South Korea, the film that repeatedly came up was ‘Take Care of My Cat.’ Set in Incheon and Seoul, the film chronicles the lives of a group of friends — five young women from different economic backgrounds and family situations — a year after they graduate from high school, showing the changes and difficulties they face in both their friendships and the working world. Though the film did not do well at the box office and was soon pulled from screens, a letter-writing campaign by its fans managed to get it back into theaters, and the film won many awards. After the screening, the film's director, Jeong Jae-eun, will take part in a 90-minute Interview and Question and Answer session after the screening. After directing two features and several shorts, director Jeong moved to directing documentaries, including "Talking Architect" (2012), about celebrated maverick Korean architect Chung Guyon (a trailer is here) and "City:Hall" (2013), which examined the creative and political pressures that affected the controversial design of Seoul's new City Hall (a review is here). While the screening is free, the there will be an admission fee (of perhaps 7,000 won) for the interview with the director to cover the cost of the interpreter, etc. 4. 4:10pm to 5:40pm – Interview and Question and Answer with Director Jeong Jae-eun. Directions to Seoul Global Center's Haechi Hall can be found here and here, and more information about the film is here , and the screening, here. An article in today's Joongang Daily declares in its headline that "Textbooks do disservice to March 1 movement." Rep. Han Sun-kyo, a lawmaker of the ruling Saenuri Party, told the JoongAng Ilbo on Thursday that he analyzed Korean and Japanese history textbooks he received from the Seoul-based think tank Northeast Asian History Foundation and Korea’s Ministry of Education and found the results troubling. March 1, 1919, remains a touchstone of Korean nationalism as the day when activists declared Korea’s independence and triggered large-scale peaceful demonstrations against Japanese colonial rule (1910-1945). According to Han’s study, half of the eight Korean high school history textbooks inaccurately described the independence movement as being “violent.” Three other textbooks failed to describe the movement adequately. Initially the demonstrations were nonviolent, partly to enhance the moral appeal of the protest and partly because of the vastly superior Japanese police and army forces. The usual pattern of demonstrations was that activists assembled a crowd and a local leader read the declaration of independence. The crowd roared its approval and then marched around the area shouting for Korean liberty. During March and April the first stage of the 1919 movement occurred—the overt and violent period. Hundreds of thousands of Koreans engaged in open political actions ranging from lusty shouts for freedom to intrepid assaults on Government General outposts and vengeful mutilation of unlucky Kenpeitai, the Japanese gendarmerie. The second stage of the movement began in May and lasted until about April, 1920. During this stage, the independence activists changed their form of political activity from overt protest to covert planning and organizing, mostly in support of the Korean provisional government formed in Shanghai on April 10, 1919. The presence of additional troops from Japan, mass-arrest tactics, and stringent security measures made open protest activity unfeasible if not impossible. The Government General juggled the available troops, withdrawing some from North and South P'yöng'an and Hwanghae, now regarded as safe, and assigned them to southern Korea, where the violence was rapidly spreading. On March 25 eight infantry companies were spread thinly over five southern provinces—North and South Kyöngsang, North and South Cholla, and South Ch'ungch'öng. The assignment was made with the hope that they would only be needed until March 30. But the Koreans kept up their attacks. Crowds formed everywhere in Seoul, stoning police stations and trolley cars. In five villages near Seoul, myön chiefs were threatened and myön offices attacked. 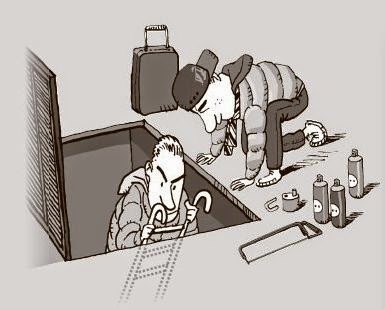 In many places Koreans armed themselves with clubs and stones and attacked the closest police station or my on office. March 27 and 28 were frantic, tragic days as Koreans attacked in many localities only to be beaten off by troops and suffer heavy casualties. Thirty nine Koreans were killed in a single incident in Kyönggi Province. The governor general authorized new troop assignments on the 28th but the attacks continued. On March 31 Koreans armed with clubs, sickles, and other improvised weapons stormed gendarmerie units and police stations at several places in Kyönggi Province. They attempted, sometimes successfully, to burn the local public buildings—myön offices, post offices, police stations—and cut telephone lines. In one place the crowd tried to burn the stores of Japanese merchants. 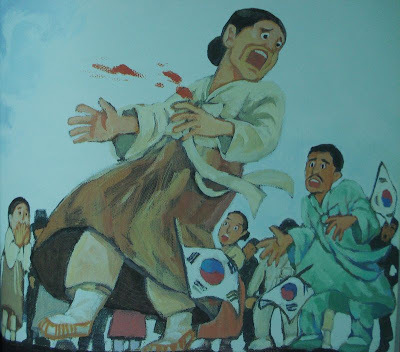 Many Koreans were killed and wounded in the assaults. 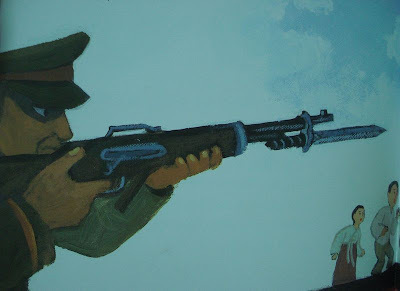 Despite heavy casualties and against seemingly hopeless Koreans continued the fight. [...] April 2 was perhaps the bloodiest single day of the independence movement as Koreans continued their attacks on gendarmerie units, police stations, myön offices and school buildings. Demonstration marches were a thing of the past: these crowds were prepared to fight. 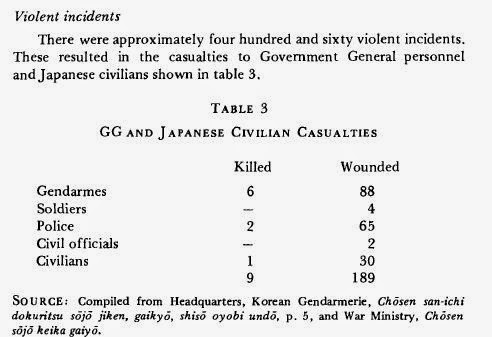 Because of continued Korean violence, the Government General requested troops from Japan, which served to further discredit Japanese rule in the colony and provided additional incentive for the Hara administration in Tokyo to make reforms. Violent forms of participation appear to have been most important in changing Japanese policy. 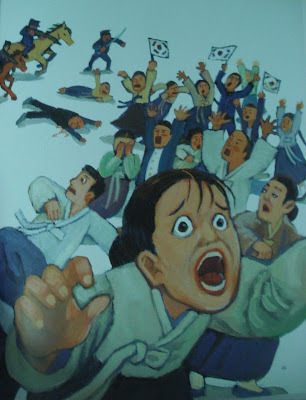 Additionally, the Jeam-ri massacre (looked at here) is better explained as the culmination of escalating violence on both sides rather than an out-of-the-blue mass killing by the (evil) Japanese. 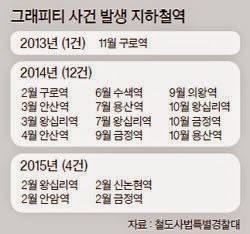 Han also found that only one publisher, Jihak Publishing, described the patriot [Yoo Gwan-sun] in its text. In contrast, four out of seven Japanese contemporary history textbooks included Yoo. "Eat Ddorae Orae Chicken and protect our land, Dokdo!" Yoo (1902-1920) was a prominent independence movement activist who was one of the organizers of the March 1 movement. She eventually faced torture at the hands of Japanese officers and died in prison in September 1920. When her family asked for her body to be returned to them, Yoo’s body was returned cut into pieces. In truth, most of the "organizers" of the movement offered themselves up for arrest after reading the declaration on March 1, essentially robbing the movement of its most respected leaders at its very inception. 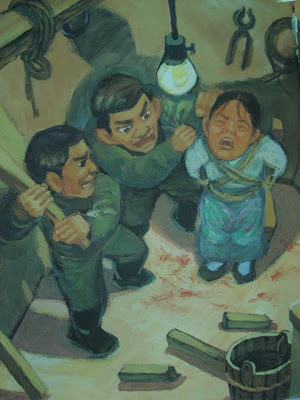 Yoo certainly organized protests in Cheonan after leaving the Ehwa school girl for girls, but is more likely remembered because she was a student at a prominent missionary school, and because she is the perfect symbol of innocence brutally snuffed out by the brutal Japanese. The main problem I have with the paragraph above, however, is that she was certainly not "cut into pieces." As is described by Jeannette Walter, an English teacher at Ehwa, in Donald Clark's "Living Dangerously in Korea (The Western Experience 1900-1950),"
Yu Kwansoon, a little sixteen-year-old girl, died in prison. We had her body brought back to the school, and the girls prepared cotton garments for her burial. [...] However, when I was in Korea in 1959, I was interviewed by a group from Kwansoon's school, and I assured them on tape that her body was not mutilated. I had dressed her for burial. One wonders if it is Rep. Han Sun-kyo or the Joongang Daily that is responsible for that canard once again being trotted out. A disservice may be have been done to the memory of the Samil Movement, but I'm not convinced its the textbook makers who are responsible.